This is a story…Why is it that whenever I write or say that I want to bust out into the Fresh Prince Of Bel Air theme song? Let’s start over, shall we? What I am about to tell you is a true story. It happened to me a few days ago. 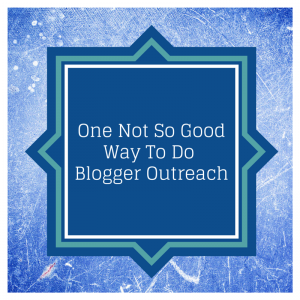 It’s a tale of a blogger and an outreacher. As someone who does outreach all the time, it got me thinking. In fact, I was on on the receiving side of things which allowed me to have a completely different outlook on the situation. Yes, I consider myself a blogger. In fact, I take great pride in our blog. I write about the real tools I use and the real strategies I use myself and for our clients. Now that you have a little backstory, here’s what happened. I am not going to name names, but I have written about a particular tool at least a few times on this blog. Sometimes I link to it in my blog and other times I don’t. It’s my blog post, I can do what I please. 🙂 See how that works. Anyway, oftentimes I get emails from people who I’ve linked to with a thank you or sometimes even with a slight change or an update. I love to get mail like this because it shows that people are listening, reading and following best practices. But the other day I got a note asking me to link to this particular company in my blog post so more of my readers can find them. It sounds harmless I know. As a startup, as a business, we want those links more than anything. They help with SEO and they help bring you more traffic. I get it. I like links a lot too. But the way the letter was written made it feel like it was all about the company and not about the blogger. Of course I added the link, but what would have been a better tactic for this company to do would have been offering me, the blogger something in exchange for helping. Perhaps a thank you in the form of a free trial, a discount, or something else that would have helped me blog about the company even more. Now, I’m happy. And the company is even happier because of the future press that could have happened. Maybe I’m being picky. Maybe I’m just in a mood. Whatever. I think it is so important to reiterate the fact that social media and online business relies on relationships. A thank you goes a long way and the power of reciprocation is even stronger. So what can you learn from this story? Simple, when you are doing outreach think of it as a mutually beneficial relationship between you, the company and the blogger or Influencer. Give and receive. Don’t just ask to receive. I know I am going to adjust my outreach strategy going forward that’s for sure. I agree with you. People who just ask for things without establishing rapport or offering you something in return seem to be overstepping some invisible, unspoken boundaries that just rub you the wrong way!